Absolutely I have had lessons/rides that set me back on my heels a bit. Inevitably, working through it leads to better riding from me, and a better, more trusting relationship with my horse. Great job riding through it! Well…yes. That is true. Gah that just still rankles haha. That exercise is making my heart skip a beat due to nerves and I didnt even ride it LOL. My mare is the queen of adding a stride between the placing pole and the actual fence. It’s not fun. No matter the striding. It’s her thing. Glad it’s not just May! Like I think that, if the placement pole wasn’t there, she would have sucked back a stride earlier to more easily fit in the extra step. But the placement pole resulted in a STRETCH then JAM for the last two strides. NOT fun to ride at all hahaha. Once I had Mr. Tappy though, it all fell into place. YUP. My horse. To a tee. I don’t miss jumping sometimes when I think about those moments. I love that you are sore after staying on 🙂 You probably would have been less sore if you had fallen off! HA. May had to be reminded who is the captain of this ship hahaha. I really wanted to curl up in a fetal position and call it a day. or ask her to make things smaller, or SOMETHING. But I am glad that I pulled up my breeches and did the thing. good for you for working through it! that exercise looks really really awesome, but then again it also looks like exactly the kind of thing that could easily catch out any little mistakes by horse or rider. That exercise is not easy!! It was not… why it was the thing that made me DYING for a jump lesson, I have no idea… but I survived! I know this feeling alllllllllllll too well. Teaching Des how to leg yield in a lesson a few years ago was just so. damn. hard. And I almost got off and went “screw this”, but everytime I have ever thought like that I know I need to shut up and trust my trainer because by the end we are doing better quality work then ever before. It’s all about faith in the people around you I guess. You gotta trust that they are going to get you where you want to go. Yup. I agree. After the lesson, I was chatting with my trainer a bit more about what happened and, guess what, the root of the issue I was having is what comes up A LOT in my SJ rounds. Shocking. I know. But not a fun thing to work through. Unless you’re Michael Jung… The only chips he sees are chocolate ones. I think it has to get messy to get better! And it always feels way worse than it really is. Almost eating dirt was pretty bad. I wish I had media of it… but I agree. It has been a long time since I felt genuinely CHALLENGED like I did this week, and I think that is a good thing. Tough sounding exercises! But yay for sticking with it and finding success. I love feeling challenged like that – makes successes all the sweeter. Dang girl that sounds like a DIFFICULT exercise!! Huge props to you for getting through it! 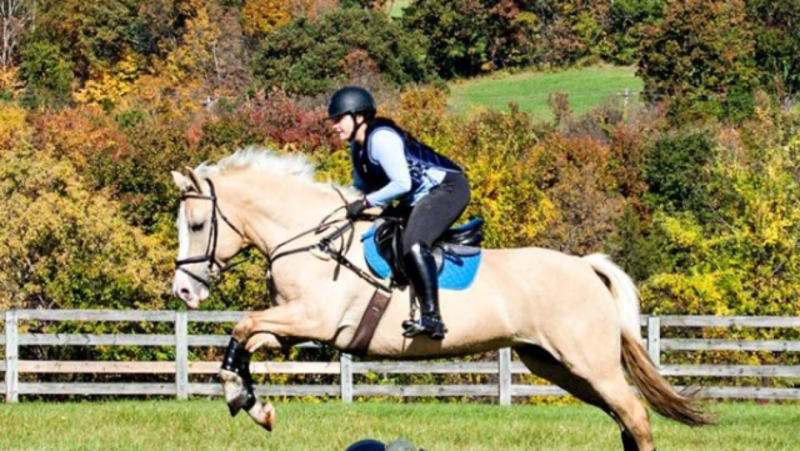 If I hadn’t had a jump lesson in 4 months I would have been in the fetal position by the end of that lesson. I think it can be really hard to hit super low points in lessons, but it can also mean you are getting out of your comfort zone, which is how we truly grow. Keep up the good work lady! !